For anyone new to salmon fishing or who has not fished for salmon in Scotland before below is a quick explanation as to what we are referring to when we talk about a salmon fishing beat in Scotland. 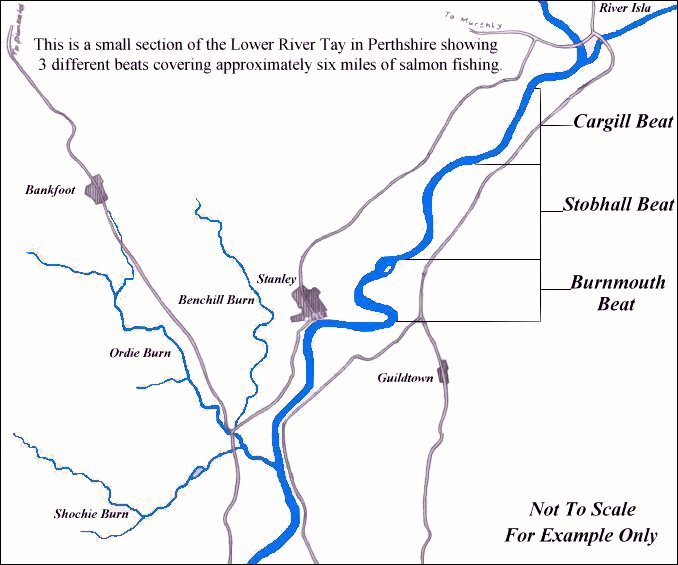 Simply put, all salmon fishing rivers in Scotland are divided into individual stretches of river known as beats. Each beat can be 2 or 3 miles long and is determined by who owns the land on either side of the river. The landowners are known as riparian owners which means that they own the land or river bank that runs alongside the river and own the fishing rights (providing they haven't sold or leased out the rights). Riparian owners are responsible for maintaining the river banks and ensuring that the water flow is not obstructed as well as a number of other environmental issues which I won't go into here as it has nothing to do with explaining what a salmon fishing beat actually is. So a beat is a stretch of the river where the fishing rights are owned by the landowner of the land that the river runs adjacent to. This means that generally the longer the river the more differently owned land it will pass through and the more beats it will probably have. The shorter the river the less beats. The riparian owner determines the number of people allowed to fish on their beat per day and this usually depends on the length of the beat. A typical 2 mile beat would normally issue a maximum of between 6 or 8 permits per day and therefore there would be a maximum of between 6 to 8 anglers only fishing on a 2 mile strech of water. There is no national rod licence required to fish in Scotland as there is in England so the only permit required is the permit issued by the beat. The price of a salmon fishing permit is also determined by the riparian owner and as a general rule of thumb the better the beat in terms of the annual catch rate the more expensive the permit. Permit prices vary throughout the season and are generally a lot more expensive from August to October which is when the main salmon runs traditionally take place each year on most of Scotland's salmon rivers. Having said this salmon can be caught at any time throughout the season albeit in smaller numbers. There is a smaller spring run of salmon which usually takes place in April and May on most of Scotland's rivers. Most beat owners provide a number of services and facilities for their stretch of the river including a fishing bothy with a kettle, microwave oven, dining area and toilets (these do not have bedrooms and are not used for providing accommodation). On a number of beats boats and a boatman are available and the beat owners also maintain the river banks ensuring safe and easy access to the river. We can choose which rivers and salmon fishing beats we fish on and we only fish on the best quality beats on some of the most productive salmon fishing rivers in Scotland. This gives us the flexibility to take our clients to a different beat or different river each day, providing a far more interesting a varied salmon fishing trip and increasing your chances of hooking into some Scottish Atlantic Salmon.